Title sheet of the Liesganig map. Source: WIG map archive. Almost immediately after taking the lands of Galicia in the first partition of the Polish-Lithuanian Commonwealth in 1772, the Austrian Empire began measuring and mapping their new crownland. 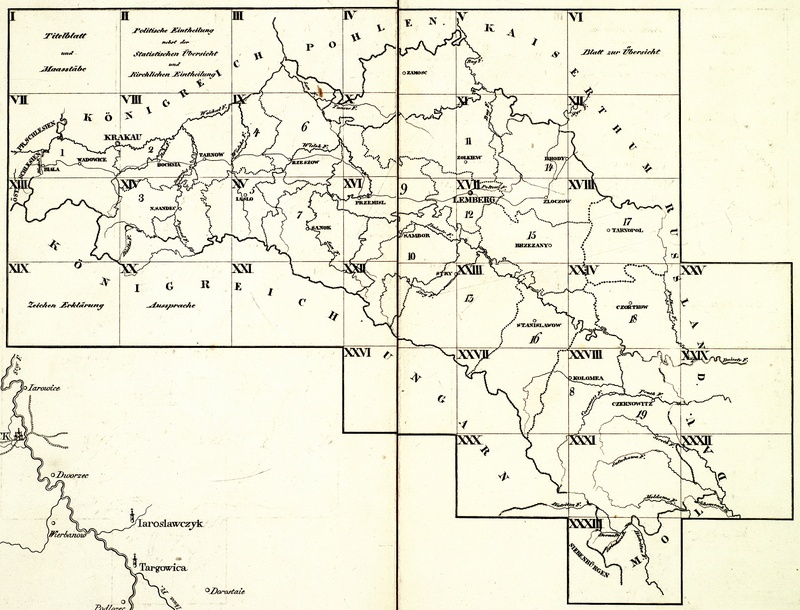 One of the first to serve the Empire in this role was the Austrian Jesuit practical geodesist Joseph Liesganig (1719~1799), and his work in 1790 formed the basis for the map presented here (which commonly carries his name: the “Liesganig Map“). In addition to his achievements in measuring the earth’s shape and managing major survey projects, he also established standards for measurement and stabilized the Austrian toise (essentially a fathom) to serve the cadastral map surveys across the entire Empire for a century after his death. Sheet index to the Liesganig map. Source: WIG map archive. The map shown here is sheet 17 of a map set of 33 sheets made by D. Huber using copperplate engraving for a second edition in 1824. 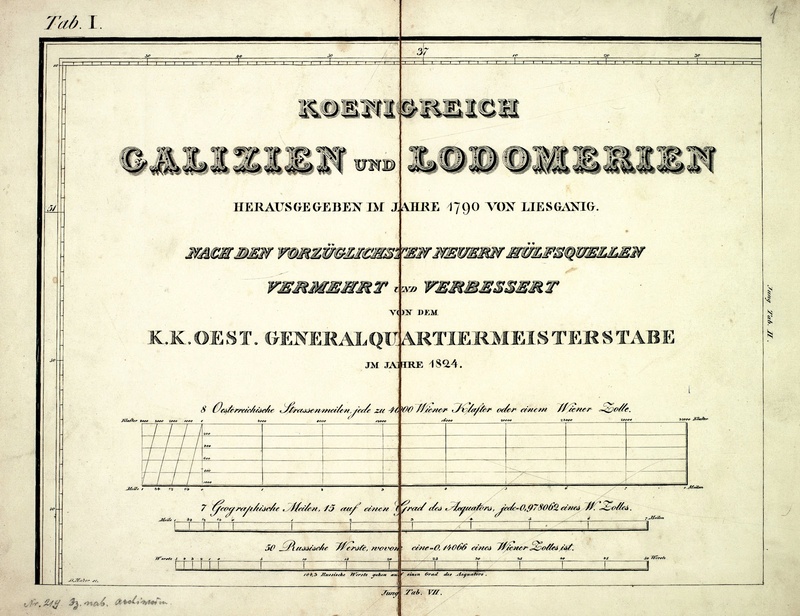 Each plate was approximately 24x32cm (~9.5×12.5in), drafted at a scale of roughly 1:288,000 (4000 Viennese Klafter to one Viennese Zolle, or 4000 fathoms to the inch). 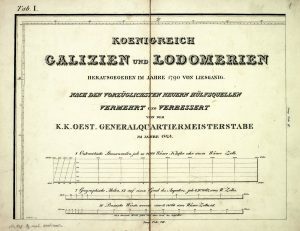 The map set title spans across sheet 1:Koenigreich Galizien und Lodomerien, Herausgegeben im Jahre 1790 von Liesganig; Nach den Vorzüglichsten Neuern Hülfsquellen, Vermehrt und Verbessert von dem K. K. Oest. Generalquartiermeisterstabe im Jahre 1824. Which means basically that it’s based on Liesganig’s work in 1790 but now “much improved and modernized”. Statistical summary on the Liesganig map. Source: WIG map archive. 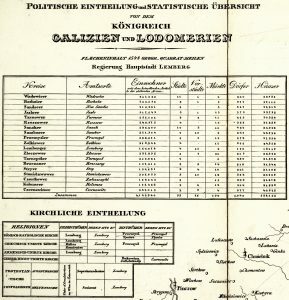 This sheet 17 covers not only the region immediately around Rohatyn but also Galicia’s head city of Lemberg (today’s Lviv). The crownland was divided into 19 political units called kreise (circles); Rohatyn appears in kreis 15, under the lead city of Brzeżany (also shown on sheet 17). 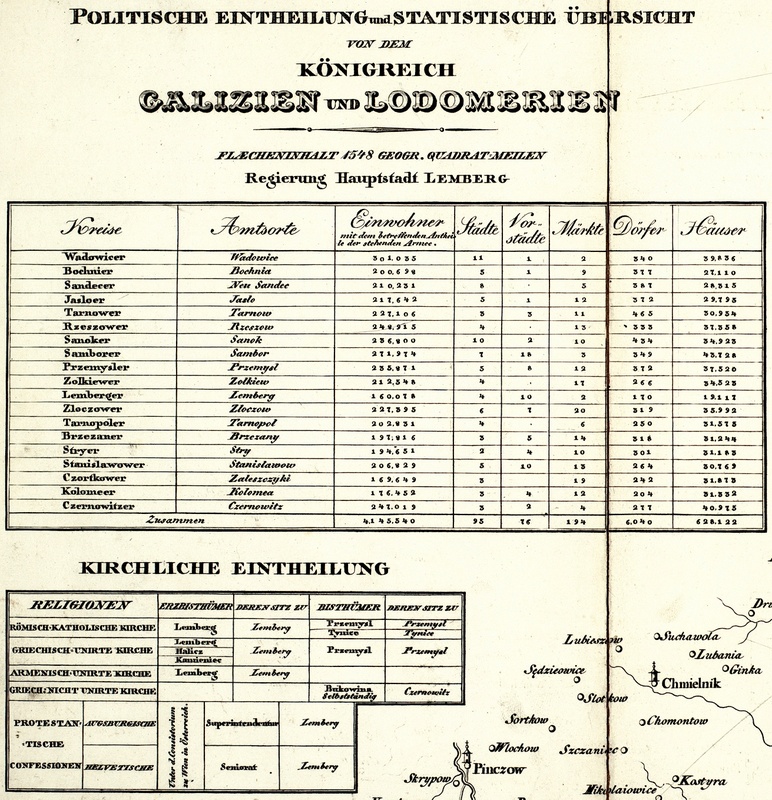 A statistical table appears on sheet 2 of the set, which shows that Rohatyn was one of 3 cities (highest political class) in its kreis, along with 5 Vorstädte (urban settlements outside inner city walls), 14 towns, and 318 villages.The table also lists a total 1824 Brzeżany kreis population of 197,816 citizens, living in 31,244 houses. Clearly the Empire had been busy with survey work. The same sheet 2 also indicates the ecclesiastical divisions of Galicia at the time, showing the seats of six different faiths; Jewish administrations are not indicated. Symbol legend for the Liesganig map. Source: WIG map archive. Also included in the set is a graphical sheet index (on sheet 6), a legend of symbols (on sheet 19), and a Polish-German language conversion table to help the new Austrian administrators understand the terms used by their Polish-speaking subjects, and vice versa. The legend confirms that Rohatyn had city (Stadt) status, shows the numerous village churches in the surrounding area, and identifies the north-south road through Rohatyn (today’s vul. Halytska) as a major communication route. Special engraver’s marks indicate hilly terrain (hachuring) and forests (stippling) around Rohatyn, through which the Lipa River (today’s Hnyla Lypa) meanders. All 33 sheets are accessible online in various incomplete and complete sets, of varying quality. 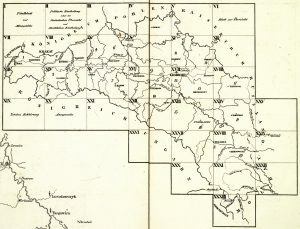 Despite the geodesic advances of the Austrian Empire, rather large drafting errors and the scale of the maps caused some towns to be significantly misplaced with respect to true geography; the rubbersheet georeference in this map caused noticeable distortions, and some towns were left unfit to avoid excessive stretching. Only sheet 17 is presented here in an overlay on Bing Maps satellite data from the contemporary town. The image is interactive: pan and zoom are available with ordinary mouse controls or gestures, depending on the device, and zoom is also available by the +/- buttons in the upper left of the display. The map can be made transparent in 10 steps by sliding the control in the upper right of the image. If you have a large screen and want to see more of the map at once, you can launch a new window with just the overlay and resize it to fill your screen. This 1824 regional map is one of a series of historical map overlays included in the project Mapping Rohatyn: Geography as an Education Resource.